Louis Oosthuizen still remembers getting together with other kids from the Ernie Els Foundation to watch highlights of their hero winning the British Open at Muirfield in 2002. The shot out of a pot bunker on the 13th. His birdie on the 17th to tie for the lead. The bunker shot on the 18th hole to win the longest sudden-death playoff ever in a British Open. "We were actually getting goose bumps," Oosthuizen said. "Just seeing that ... you're always thinking, 'I hope that happens to me.'" Hard as it is to imagine - even to the 27-year-old South African - it just might. After opening with a three-putt bogey, Oosthuizen played with remarkable poise on another windswept afternoon at St. Andrews. He never dropped another shot, never stopped smiling, and finished with a drive onto the 18th green for one last birdie and a 3-under 69. It gave him a four-shot lead over Paul Casey and put him one round away from becoming the first player in 46 years to capture his first major championship at the home of golf. This, from a player who had only made it to the weekend one time in eight previous majors. From a South African who had never won on the European Tour until four months ago. "I don't think anyone was thinking I was going to be up there," Oosthuizen said. "You've heard yourself, no one can actually say my surname, so they don't even know who I am out there. It's great being up there. I just want to enjoy everything about it. I loved it out there. It was great fun for me. And hopefully, tomorrow will be the same." Gary Player left him a message at his hotel. Els called Saturday morning for support, telling Oosthuizen to enjoy himself on a stage like no other in golf. Eight years after leaving the Els foundation, Oosthuizen still follows his instructions. Oosthuizen (WUHST-hy-zen) was at 15-under 201. A victory Sunday would make him the first player since Tony Lema in 1964 to win his first major at St. Andrews. 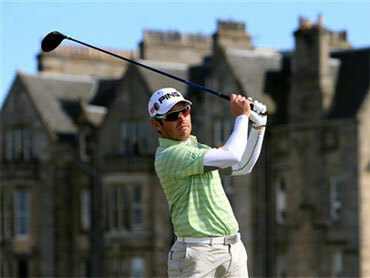 "The Open at St. Andrews would be something special," Oosthuizen said. "It's one of those things you dream of." Everyone kept waiting for him to fold, and the final test in the third round came on his second shot to the 17th green, where the pine was planted perilously behind the Road Hole bunker. With a slightly uphill lie, Oosthuizen couldn't bounce the ball away from the bunker and onto the green. So he played it safe, riding a 5-iron with right-to-left wind, keeping it between the bunker in front of the green and road behind it. He didn't mind that it ran through the green and onto the 18th tee, just as Casey was preparing to hit his tee shot. Casey smiled. Lee Westwood walked over to the ball and acted as if he was going to smash the ball back at Oosthuizen. The way he's playing, even that might not have stopped him at St. Andrews. "I'm loving the fact I'm playing absolutely great golf and I'm four shots behind Louis," Casey said. Casey went out in 31 when the wind was at its strongest, and mostly into his face. He finished off a bogey-free round of 67 that puts him in the final group of a major for the first time. He was at 11-under 205. It might be a two-man race between players who have never seriously challenged in a major. In fact, none of the six players within nine shots of the lead have won a major. Oosthuizen was seven shots clear of Martin Kaymer of Germany, who had a 68 and was alone in third. Another shot behind - and eight shots out of the lead - were Henrik Stenson (67), Alejandro Canizares (71) and Westwood (71), who didn't make a birdie on the front nine but did well to at least stay in the game. Americans have won six of the last eight Opens at St. Andrews, but they have disappeared in this one. Dustin Johnson birdied his last two holes for a 69 and was nine shots behind. Tiger Woods, who won the last two times at St. Andrews by a combined 13 shots, has never been within four shots of the lead all week, and he wasn't even close Saturday. He had four long eagle putts - only one of them on a par 5 - and three-putted for par on three of them to shoot 73. He was 12 shots behind, sure to match his longest start to the season without a victory in his seventh tournament. "I'm playing better than my position," said Woods, who was tied for 18th. "I certainly have had a lot more putts on the greens than I ever have, and that's something that has basically kept me out of being in the final few groups." Phil Mickelson, who had a chance at the start of the week to go to No. 1 in the world, was another shot behind. Whatever momentum he had was lost with a 5-iron that he hooked out-of-bounds for a double bogey on No. 16 for a 70. The South African heritage at golf's oldest championship dates to Bobby Locke winning four times in a nine-year stretch after World War II. Player won the claret jug three times, and Els was the most recent in 2002. Oosthuizen, whose career was made possible by the Ernie Els Foundation at Fancourt, had to wait 28 hours from his last putt on Friday to his opening shot Saturday. "It felt like a week-and-a-half," he said. He promptly three-putted for bogey as his lead shrunk to two shots. Considering it was only the second time he made it to the weekend at a major, it looked as though it wouldn't be long before he wilted from the pressure. It was his only bogey. He picked up his first birdie on the seventh hole, then added a surprise birdie late in his round with a 60-foot putt. Even with a four-shot lead - the largest 54-hole lead in the Open since Woods led by six shots in 2000 - the real test comes Sunday. Casey ran off three birdies in a four-hole stretch early in his round, and he got as close as one-shot with a two-putt birdie on the ninth. But he had to settle for nothing better than par on the back nine, missing a 5-foot birdie on the 18th. "I'm having a great time, and I'm going to go out there tomorrow and enjoy myself and have a good attitude," Casey said. "I know what this golf course can do. It can give you some great moments, and it can give you some horrible ones." A few weird moments, too. Miguel Angel Jimenez added another highlight to the infamous Road Hole when he turned his back on the green and banged a shot off the waist-high wall, where it caromed back over the road, up a slope and onto the green. Mark Calcavecchia wound up with a quadruple-bogey 9 on the par-5 fifth hole when he hit into a gorse bush, played a provisional for a lost ball, picked up his provision shot when he heard the ball was found, then learned that the ball wasn't his. That explains his 77, which sent the 50-year-old tumbling down the leaderboard. Woods also hit into the gorse for a bogey on the fifth. On the next hole, he hit a low shot to the front of the green for a birdie chance, but the wind blew it some 20 yards back into the fairway before he got there. Moments like those might be enough to give Westwood hope. Johnson had a three-shot lead going into the final round of the U.S. Open and shot 82. The largest comeback in British Open history is 10 shots by Paul Lawrie at Carnoustie, but that required a debacle by Jean Van de Velde on the last hole. "Strange things have been happening this week," Westwood said. "It can be done - we know that. It depends on the weather. If it's a miserable, windy day, anything can happen. But Louis and Paul look like they are playing well."